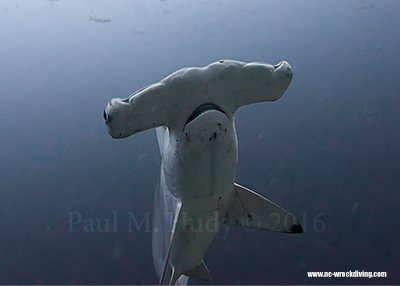 The video below shows what happened during the 2015 BFDC Cocos Trip! In 2007, 2013 and 2015, BFDC members traveled to Cocos Island, Costa Rica on the M/V Sea Hunter. I first visited Cocos in 1990 and 1994 and it stole my soul. The sense of adventure and wildness I experienced while there has rarely been matched. And we are not getting any younger, so it is time to go back! Nick-named, the "Island of the Sharks", Cocos Island is over 300 miles off the Pacific Coast of Costa Rica and can only be reached by boat. It is one the Costa Rica's national parks. Except of a ranger station, it is uninhabited and for 100's and 1000's of miles, it is surrounded by the deep waters of the Pacific Ocean. It is as remote a dive destination that you will ever find. This makes it a perfect environment for diversity and numbers of marine life. It is known for sharks, sharks and more sharks. The classic Cocos "scene" is the massive schools of hammerhead sharks, but there are also white tip reef sharks, galapagos sharks, silky sharks, tiger sharks and even the occasional whale shark. If you follow the vimeo links below, you even see that orcas and other whales visit the waters off of Cocos. But while you are looking into the blue at the underwater "mountain views", don't forget to look at your feet because Cocos has an abundance of small and beautiful marine life as well. It is a UNESCO World Heritage Site and has often been considered one of the wonders of the natural world. It has been the inspiration for the books Treasure Island and Jurrasic Park. It even comes with its own treasure legend as explorers, sailors and pirates have been visiting the island since the 1700s. We didn't find any gold doubloons the last time we were there, but who knows? We had a great time both above and underwater. We will be returning in 2018 and we were wondering if anyone would like to join us? DAY 2: Picked Up at your hotel and transferred by bus to Puntarenas where you will board the M/V Sea Hunter. 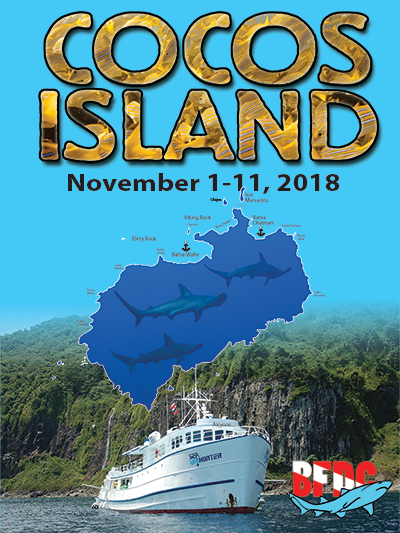 That afternoon you will begin the cruise to Cocos Island. DAY 3: All day travel to Cocos Island and time to arrange your dive and camera gear plus get to know your fellow divers. DAY 10: Make the last 3 dives before the cruise back to Punteranas, Costa Rica.